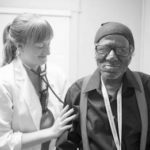 The Los Angeles Christian Health Centers (LACHC) is a non-profit, faith-based Federally Qualified Health Center, committed to showing God’s love through health care across Skid Row, Boyle Heights, and South Los Angeles. LACHC takes a patient-centered, team-based approach and wraps services around each patient to deliver improved health outcomes for the vulnerable communities served by its network of two full-time clinics,12 satellite sites, and street medicine teams. LACHC’s model breaks down barriers by taking care of as many needs as possible under one roof: medical, dental, optometry, mental health, and social services. This “one-stop shopping” means patients have a true health home. In 2016, LACHC’s staff of 140 (along with many dedicated volunteers) cared for more than 10,000 patients through more than 57,000 visits.